- Where are the funding sources for the system? 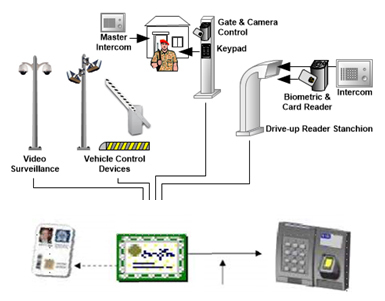 An integrated airport security system to protect personnel, buildings, vehicles and resources that are sensitive within an airport environment exploits a combination of physical security assets interconnected by wired and wireless communications and, to an increasing extent, implemented as a networked digital platform System design must address all security functions in this context. The importance of safety and security to airport operators is universally accepted as a priority in the aviation industry. The execution of programs supported by technology for achieving a secure and safe environment is influenced by a range of factors, including the airport size, scope and complexity of operations, level of staff, operating budget and availability of critical resources. The overall organizational approach that an airport takes to achieve its safety and security objectives is often referred to as Concept of Operations (ConOps). The term ConOps refers to the need to establish and document user requirements that determine how airport operations will be conducted, including operational response to major events and assurances that all technology and human assets of the airport are able and equipped to respond. Airport perimeter security has traditionally focused on external areas and outdoor environments. Historically, ‘perimeter security’ has been generally described as the outermost airport legal boundary or perimeter. This may be the outermost perimeter fence, wall, and/or other natural boundaries. A variety of different technologies might be used to alert of a breach or detect an intrusion. A Perimeter Intrusion Detection System (PIDS) is the front line defense to detect, assess, locate, identify and respond to outside threats. For this reason, a perimeter defining specific security area allows for more precise intrusion detection. Intrusion may be in the terminal area (moving from the open to screened area), the breach of a door from the sterile area to the AOA, unauthorized access by an individual to a high security area, or unauthorized vehicle access into a protected area within the facility or on the AOA. Airport operators utilize a number of surveillance techniques – most prevalently closed circuit television (CCTV) and video surveillance systems. When selecting a system, overall bandwidth requirements for the infrastructure and physical cabling, operational performance and associated metrics, and the overall architecture are but a few factors to be considered. 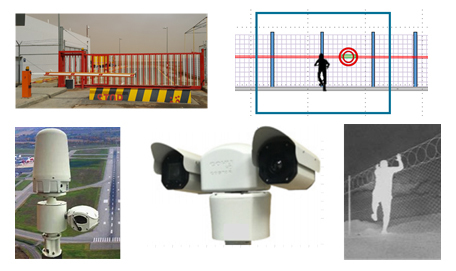 Additionally, pan-tilt-zoom (PTZ) camera functionality, compression techniques as related to bandwidth requirements for network transport and overall video analytics, location and placement of cameras related to environmental conditions (temperature, wind, precipitation, high-/ low-light conditions) are considerations. Physical Access Control Systems (PACS) encompass the physical assets and infrastructure associated with airport operations. ID credentials, readers, locks, databases and associated hardware platforms, scanners, and network infrastructure supporting connectivity of these assets make up a PACS and integrate into the overall security requirements of the airport. The high usage of these assets necessitates the selection of reliable equipment with close attention being placed on the maintenance and operational characteristics of the selected devices. 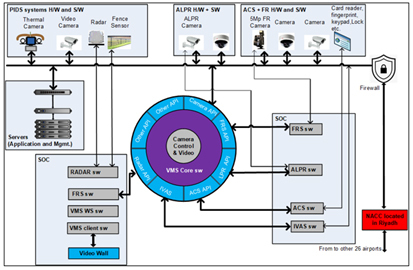 At its core, the PACS may provide alarm monitoring, graphical map viewing with device location linking (plotting), video system interface and surveillance management, photo identification badging, and security control functions within the user’s facility. 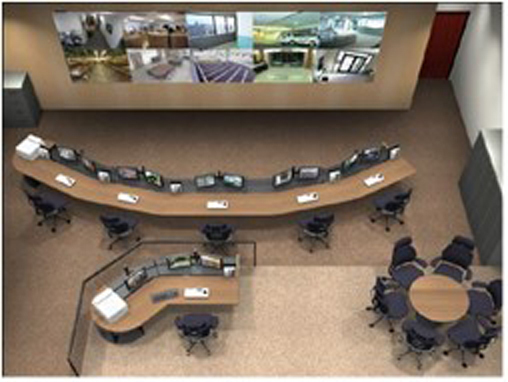 The Security Operations Center (SOC) is the functional ‘heart’ of an airport’s security ACS with location and operational characteristics unique to each airport. Guidance and recommended best for implementing SOCs will vary from airport to airport; functions implemented as multiple systems can be represented in an SOC as an integrated feature on a single device. Ideally, a SOC utilizes inputs from PIDS, fire / life / safety (FLS) systems, PACS, CCTV / video monitoring systems (VMS), and other data / voice / surface sensor inputs to assemble a more comprehensive ‘situational awareness’ of the operations of the airport and an analysis of any threat to its security. Situational awareness is a major objective of SOC design, and it relies heavily on an integration strategies and communications infrastructure to sustain the various inputs, processes and displays necessary to provide that common picture. The level of integration and degree at which components are integrated is at the discretion of the airport operator and the need to satisfy diverse requirements levied by various stakeholders. Integration accomplished at the component/subsystem level (whereby hardware and software share common infrastructure such as in LAN/WAN/MAN networking), properly applied, can lead to greater overall efficiencies. Integration of legacy systems and existing infrastructure investments integrated into new/emerging systems can generate greater common operating pictures to satisfy stakeholder requirements. The level of complexity and the degree of consolidation of existing and emerging systems will determine overall system performance. Interoperability with tenant systems (cargo, food service, fueling, etc.) on the airport requires coverage. Operational requirements, system compatibility, system interfaces, and potentially, interoperability with tenant systems, as well as situational awareness and information exchange with the SOC are but a few of the elements of concern to the planning, design and implementation of an ‘integrated’ approach to meeting the needs set forth in the security ConOps.